After the remnants of Tropical Storm Alberta blew through yesterday, my sister and I thought today would be a good beach day. 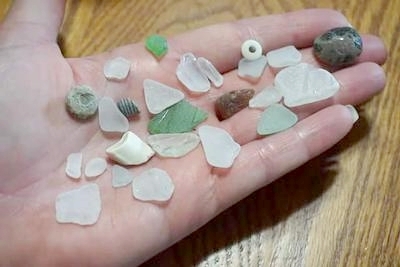 I've found lots of beach glass here over the years, but the past year was only few and far between small pieces. But, just a couple of hours today and Alberta made for perfect finds!! A handful!! Not only did I find great pieces of glass today, I found a few petoskeys, blue and green slag, and lots of pretty unique colorful stones!! For those with sensitive feet, wear water shoes as this beach is full of stones, perfect for beach combers! !